The Fort Worth Police, along with the Tarrant County District Attorney have brought the Metroplex to a new low for civil liberties. and Harris County had similar programs in place. It is embarrassing that tax dollars are spent sending prosecutors on vacation to learn how to further erode civil liberties. Lloyd’s junket resulted in this new low for liberty in Texas. At least 18 motorists suspected of driving while intoxicated were arrested Monday night and Tuesday morning during the Fort Worth Police Department’s “No Refusal” DWI campaign. Of that number, 10 drivers refused to provide a breath specimen, prompting police to obtain a search warrant and draw their blood to determine whether their blood-alcohol levels were above the legal limit of 0.08. At least one had to be restrained while his blood was taken, said Lt. Dean Sullivan, a police spokesman. Texas is now forcibly restraining citizens to draw their blood. Citizens who are merely under suspicion of a crime and have injured no one. No law in Texas allows for these blood draws. How did we get here? Judicial activism, creative prosecutors, and rubber stamp magistrates. Texas law is clear, barring an accident involving death or serious bodily injury, you can refuse to give a blood/breath specimen. 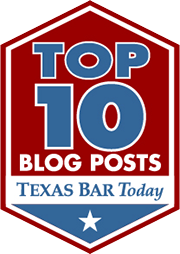 Texas has a popular and misguided law- implied consent. The idea being that you can lose your license if you did not give a breath sample upon request. The law is clear that driver’s have a right to refuse a sample. The legislature then created a procedure that allowed for blood draws in for accidents resulting in seriously bodily injury. So if you were suspected of DWI that resulted in death or serious injury the police could draw blood. Barring that, you could still refuse to give a sample. Mr. Welchel and his ilk could have lobbied the legislature for an expansion of the implied consent law. Instead, prosecutors have decided to make an Orwellian farce out of the criminal justice system and rely on a pro State appellate court for some needed judicial activism. The idea behind this tragedy is that the blood in your body is evidence. The State merely needs a warrant to get this “evidence” for their DWI case. To game the system prosecutors set up a friendly magistrate to sign the warrants on demand. Our pro-State Court of Appeals has declared this practice constitutional. Finally, this idea spreads at tax payer funded prosecutor conventions. This is how freedom dies, with creative prosecutors gaming the system and a complacent Court of Appeals finding more exceptions to the Bill of Rights. The State of Texas has no right to invade the bodies of driver’s who have injured no one. I am embarassed that we are taking forced blood draws from suspects who are deprived not only of counsel, but of liberty. I’m not sure what I feel most – fear or anger.At the risk of sounding naive’, I always wonder if these idiots have children…? I look at my daughter and I can’t imagine wanting anything less than every possible protection for her – be it from government or a civilian. It’s inconceivable to me that any parent would advocate the loss of those protections. The line has been drawn.Step over, or step off. Well dont drink and drive and you wont have to worry about this. How about my right to drive on the road and not worry about some idiot killing me and my family? Hello Robert:One comment and one question. Does the DWI impled consent statute still require that the blood sample be taken at “a sanitary place,” or something to the effect? This language has been used by law enforcement as an excuse to refuse to take blood samples from people who do not trust the on-site breath testing gizmos and volunteer for the blood sample. If the statute still requires it, did the FW cops transport each and every person to an E.M. place for testing? (Ok, two questions, or mabye three. )Comment: It seems to me that the Asst. D.A. you identified has come very close to suborning perjury from some of those arresting cops. Maybe a statistical review should be done of how many arrested persons, who were compelled to give blood, turned out not to have alcohol in the blood. Those who did not probably did not exhibit the signs of intoxication, thereby casting doubt on the honesty of the arresting officer. (And the gullible nature of the friendly JP.) On another hand, if the number who did not have alcohol in the blood is significant, that fact could impact the whole approach to probable cause for arrest for DWI. Are prosecutors getting the warrants or are police officers? The prosecutors may assist in the process, maybe help with drafting or procedure. Warrants are obtained by law enforcement. I believe the officers in this case were faxing the judge the warrant. I’m not positive. I can’t locate any cases on Westlaw where these blood warrants have been addressed on appeal. Does anyone have a case citation? There is of course a bent precedent for this – which is South Dakota’s crazed “internal possession’ drug statute – where a law enforcement officer can, upon suspicion (improbable cause, if you will), get a warrant to force a urine test for illegal drugs, with criminal penalties applicable to those who fail. In SD, this procedure is not limited to a suspicion of DUI either. 4th Amendment? Hah!